Q. How do I place a request for an item that's owned by another CSCU campus? My professor told me that I can request a book that is owned by CCSU for delivery to MCC. How do I do this? 1) Sign In - Click on the Sign In link in the upper right corner of the screen as shown below. A login screen will appear. 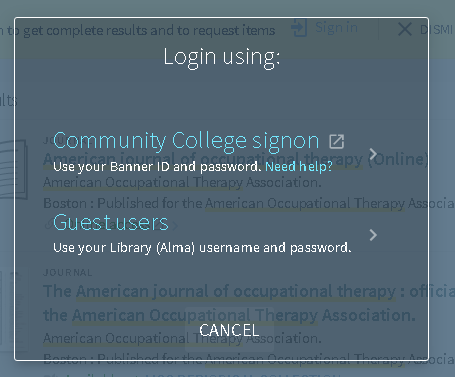 Select "Community College signon." On the next page, enter your Banner ID (ex. 1234567@students.commnet.edu) and password. 2) Search - Once you're signed in, do a search for the item you'd like to request and select "CSCU Library Consortium" as the search scope from the drop down menu. Click the green magnifying glass icon to search. When you find the correct title, click on the "Check holdings" link. 3) Check Holdings - Click on the name of a campus that owns the item to initiate a request. 4) Request - Click the Request button. 5) Fill out the form as directed. 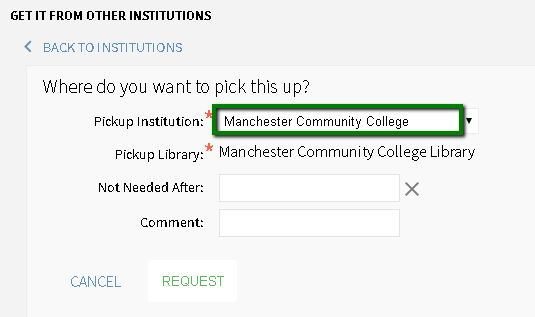 Don't forget to choose "Manchester Community College" as the Pick Up location. You'll be notified by campus email when the item arrives and is available. You can also check the status of your request by clicking on "My Library Account" by putting the cursor over your name in the upper right corner of the screen and choosing "My Library Account." View a short demonstration of this feature!